No studio or music production environment is safe. Sooner or later, the dreaded cables discussion will show its ugly face and things will go bad. Audio cables are all different. Meaning: they all look different, right? Some feel nice, others bulky, others don't match your hair color or the hipster scarf you brought in the studio while trying to act all laidback and easy going. But: do they sound different? At the studio, we decided to take a tune we recorded recently and put it straight through some of our cables. To keep things as transparent as possible, we used our Dangerous Liaison and printed a first pass through it (named "original" below) and then started to connect different cables through its Bus 6. This method ensured the best reference file that could work with the different samples. 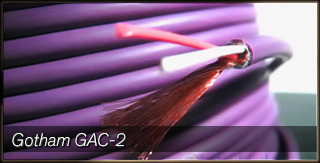 We tested four cables from four famous manufacturers, all 3.5mt in lenght: The Sommer Pegasus and Gotham GAC-2 are AES/EBU cables with 110ohm impedance: the Pegasus is a quad cable, the GAC-2 is a standard dual, the Mogami w2534 is a quad mic cable with twisted design and the VOVOX Sonorus is.. well what kind of question is this? 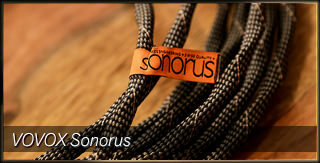 It's a VOVOX Sonorus and most people say "nothing sounds like it" or better, as the company says: "now hear this!". For the geekier minds out there, we should specify that the connectors used are all Neutrik but the Gotham GAC-2 and the VOVOX Sonorus have gold-plated connections, while the others have silver connections. If you think this difference is enough to invalidate the test: congratulations! You are a true geek. Want to get in control? Feel free to get the full resolution audio files and conduct the shootout in your favorite DAW. They are all pretty different, right? Isn't that amazing? So.. what now? Are you panicking, yet? 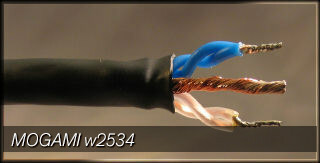 Well, for starters, you are never going to find a final answer on cables and you should pick one that you like both in terms of sound and in terms of installation: how the cable feels, bends and reacts to various misconduct is important in live rooms, on stage or in your control room. Second: there are two main principles guiding the cabling of a recording studio..some say "use the same cable for everything", others "learn which cable works best with each piece of gear". There is no real answer here: some engineers like to use the same cable everywhere, unless an application changes, for example: AES/EBU for all the control room wiring and quad mic cables for every microphone connection in the live room. Other engineers like to have a variety of cables and learn, with time, which cable works best with each piece of analog hardware they own. 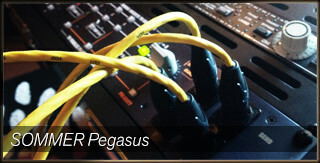 Other mastering engineers get very picky and only use certain connectors (you'd be amazed by how many of them dislike gold-plated connections!). So, in the end, there is no final answer. If you want to go all scientific, bear in mind each cable has a number of "tech specs" to check out, some of them are really important for the final result, like capacitance and impedance. But, is there anything wrong in using an AES/EBU (110ohm) for microphones? No, most engineers will tell you: try it out and hear for yourself. Others use quad mic cables for their monitoring section..because they believe they make the soundstage sound better and more 3d..maybe it's because they loose high frequencies or get a better handling at rejecting interferences? We'll never know! Some engineers, for their monitoring section, like cables that emphasize problems in a mix, rather than embellish it. Others like cables that scoop certain frequencies (like low-mids) and emphasise others (like highs) because they know their AD converter reacts better to such a change in sonic balance. As you can see.. once again: to each his own! So this is the part in which we put an end to this discussion, right? Wrong. Nothing is written in stone, especially in this job. Rather than giving you my own personal approach to it, I want to present you with a number of questions. Were you able to spot any difference in some or all of the demo clips? Do you hear those differences on a consumer-level listening environment (laptop, small speakers, earbuds) the same way you spot them on your expensive studio monitors? If a consumer-level listening environment masks those differences, do your studio cables still matter? Will your client or audience be able to discern those differences? Will those subtle differences play a role in how your music is conveyed, even if the audience is unable to rationally discern them? How do the above question weigh against the price of each cable? Will your clients be positively impressed by the fact that you offer them such attention to detail? Do you think a $1 cable is appropriate for a $15000 microphone? As you see, it looks like it is an open war. But let me tell you this: the answers are not important. There is no right or wrong way to answer.. as long as you DO formulate an answer. Having a solid approach will improve your workflow and is something that will be appreciated by your colleagues, your clients ..and possibly your girlfriend, too! The song is "Catherine" by italian singer/songwriter Fabrizio Mariani. Recorded live, mixed and mastered by Alberto Rizzo Schettino at Fuseroom Studio in May 2014.